Raleigh 70.3 and Chattanooga 70.3 were 2 weeks apart. A bit of a challenge that several people I knew decided to do this year. Throw in that Carlos and I moved out of our condo and in to temporary housing the weekend (Saturday and Sunday May 24 and 25 for the most part) between the two races and….mentally I may have been ready but physically my body would have appreciated a bit more recovery. By Sunday (the 25th) we were temporary housing – an in-law suite at our friends’ Ken and Elizabeth. And we were grateful, and our temporary home is fantastic. Memorial Day I went for a walk in the neighborhood and, after the flurry of moving activity over the weekend my legs literally laughed at me by trying to go for a short walk. I cut the walk short and went and laid in the hammock at the main house where I napped and read. And that was my holiday. Over the week my legs began to feel normal again. I could carry short efforts, but I do not think they were ready for a long haul. However, I was feeling confident and I knew I could do this, so I wasn’t worried. We were to leave Friday morning. And Thursday evening found us in a whirl wind of closing on our condo to sell it – which will have to be the topic of a whole other blog – but in short it was not a restful evening, and we did not get home until 9 pm. We owe a big thank you to our realtor and friend Jeff Lyon and fabulous friend Karen Lee who stepped up and signed for us at the closing of our former home Friday at 1 pm so we could leave for Raleigh Friday morning. Yup – we gave Karen Lee Power of Attorney! Finally, Friday morning we were off to Raleigh. I just like to get there early, register before the crowds, and attend an athlete briefing. And with Raleigh being a point-to-point, just racking your bike at T1 about 40 minutes from downtown takes most (Ok – all pretty much it seems) of the morning once you add in your pre-race shake out. Last year on race morning, Carlos had been able to drive me to Vista Point, park down Seaforth road a bit later after dropping me off, and bike back to the race start. At the athletes’ briefing I learning things had changed and no vehicles but volunteer cars and buses for athletes and spectators were getting in. And even volunteer cars they were not allowing in to the lot we parked in last year. I was immediately glad we had ended up in the race hotel (Marriott Downtown) so I could just go and set up my T2 and then hop the bus in the morning. 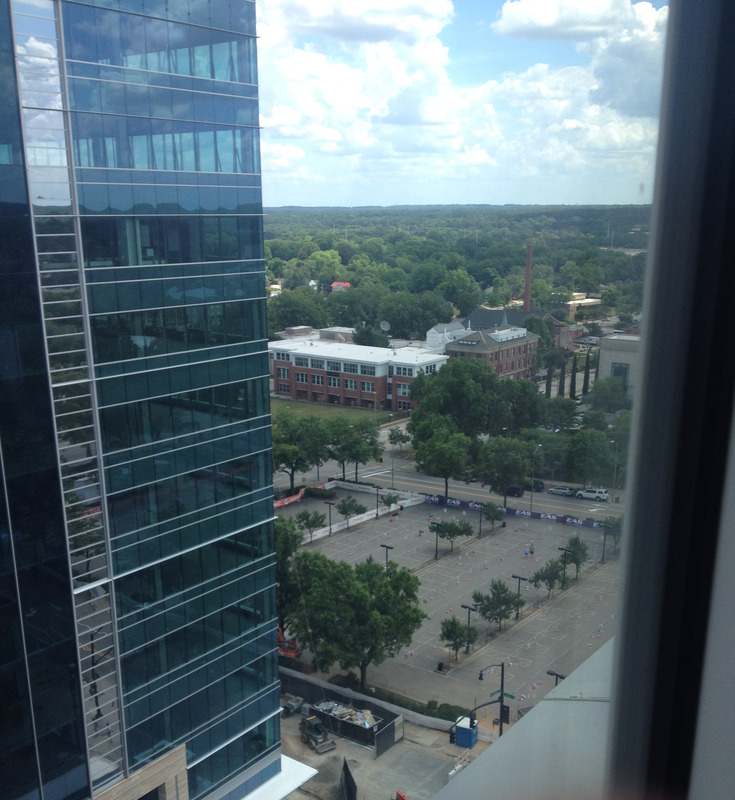 View from our room – T2 day before – no bikes! Saturday we drove towards Vista Point and stopped at a park on the north east side of Lake Jordan. Carlos and I had ridden from there before, and the traffic is much less than at Vista Point, and things are just calmer which is what I look for and want. While riding I noticed my power meter was in and out which means I needed a new battery. I made a note to buy a battery later to put in on race morning. After my shake out we continued to Vista Point where I racked my bike, let air out of the tires, and we headed out to run a few errands and then FINALLY head back to the hotel to pack bags and rest before heading out for dinner. I spoke with Carmen, a Dynamo teammate, later, and it was a fortunate thing for us we racked our bikes early. They went later in the day and said they were in traffic, just sitting there for about 30 minutes trying to get to the parking lot. The only down side to being in the Downtown Marriott is it is a nice hotel which means all the extra amenities you get used to with hotels like Hampton Inn, Fairfield Inn, and Spring Suites are not there – no microwave, no refrigerator, no free internet, etc. The most inconvenient for a race was no refrigerator so I would be unable to freeze my bottles the night before. Nothing is perfect – we got convenience to the race site, but lost something else. It was a worthwhile trade off. The fact is, again, we lucked out and we could see T2 from our room window. I can’t get too used to this – the second race so close to transition (even if it is just T2) and right at the finish line. It is it nice! I figured no refrigerator/freezer wouldn’t be a big problem for my run bottles as last year I had frozen them and dropped them off the night before and they were fine. I had put everything for each transition in to the appropriate bag Saturday night. I put everything out on top of the appropriate bag, and ran through everything with Carlos to be sure and he could confirm for me instead of me getting up to double check in the middle of the night, or just before dropping off to sleep. Then I put it all in the correct bags, ready for the next morning. I added the water to my bottles the night before figuring the tap was about room temperature anyway, so I may as well make the morning as easy as possible. I went to bed early and kind of slept. Not bad, but not great either. Better than in the past as I didn’t have to just read for 2-3 hours but, still working on sleeping well the night before. I was up at 3:45 or so, getting dressed, mixing my nutrition, and getting breakfast ready to eat on the 40 minute bus ride to transition. I felt nervous for the day and all the what ifs and fears (my big one is what if I have to go to the bathroom and it wrecks my time…seriously) but relaxed. This is new. It feels good. I set up my T2. Everything had to be in the run bag, so I set up a standard transition, just inside the bag. This is the same thing I would do if it going to rain that day, really. No big deal. And everyone had to do it. Separate transitions are so easy to set up. It is just so unnerving as it seems so small. And if you forget anything in either transition you are hosed, especially when transitions are a 40 minute drive apart. I made sure I had the basics knowing I can fake the rest. But then again I race with basics so I really didn’t have that much. Very important was the pre-race nutrition as my wave was not off until 7:52. By that time I had been up for over 4 hours already and needed to keep my body fueled and hydrated to race while warming up, walking around, waiting in port-a-potty lines, etc. I brought more than I thought I would need, and really – I should have brought more. I had a bottle with 1 scoop of heed, 1 bag of sport beans, and some peanut butter filled pretzels. I wish I had brought more heed or sports beans just to keep my body fueled and ready. On the bus were a few people I knew, including Tony Hammet and Rob Richardson from Peak Racing Team. They had just come and spoke to Team Podium (the racing team I am a part of) about Blalock Lakes Tri being held the same day. It must have been quite an effective talk as Team Podium was on the podium several times that day for Blalock. Go Team Podium! Back to the bus ride…it was pretty relaxed. I ate my standard breakfast on the way. T1 and T2 are about 40 minutes apart. Carlos was going to try and drive out, but we agreed I would not rely on him showing up. And it was a good thing. Because of the bike course change where we rode on Seaforth Rd for an out-and-back he couldn’t even bike in to the swim start. It was a very good thing we didn’t plan on him driving me in or providing any pre-race support. Once at T1 and the swim start, we learned what was already expected – non wet suit swim. No problem – I prefer non-wet suit swims when the water is over 70 as I get so hot in my wetsuit. I quickly grabbed my bike from the rack and got in line to pump my tires. It was early so didn’t take long and I was soon racking my bike again and setting up transition. I had heard that helmets were allowed on handlebars, but anything not physically on my bike had to be in the bike bag. I saw an official and double checked my set up was legal. It was. It looked so small – just my shoes and helmet. I have a visor on my helmet so I didn’t even have sunglasses. That was all as my nutrition was on my bike. I then found a quiet parking area and did my 15 minute run warm up to let my body it was a big day. Nothing hard, just an alert to my body. I sipped my sports drink after wishing I had more. And then I joined the crowds. I found my Dynamo teammates – Misty, Tanya, Carmen, and the Dynamo on-site cheer crew for the day – Stacy and Shanks. It is good to have a group to relax with when you have to wait. While in the bathroom line with Tanya I also saw Abby – my Team Podium teammate. She had been fighting strep among other things, but I know her as an athlete – she would find a way to do amazing things (spoiler alert – she did). We chatted and hugged each other good luck and she moved on as she didn’t need the port-a-potty. I cycled through the line one more time, chatted a bit with teammates, and then did a quick, 3 minute warm up swim as it helps alleviate a lot of anxiety in the first 100 meters for me. Had the last of my sports beans and got in line. It was time to start. I hadn’t seen Carlos, and hoped he was somewhere he wanted to be for the race. We got in the water. My age group was big enough that they broke us up alphabetically. That meant Abby was in the group 4 minutes behind me. I knew she would pass me in the swim – she is an amazing swimmer. I was about 4 feet (1 row) back and in the middle of the start buoys. Not as far left as about 1/3 of the women in the water. I looked to my right and there was Carmen lined up in the front at the buoy. She is also an amazing swimmer. She looked calm, confident and ready to go. I felt ready to go. Music, noise, and the horn sounded.